Used primarily as an education and reference tool after spraying a test surface. Most finishes have recommended "wet mil" application thicknesses for optimum levelling and thorough curing. 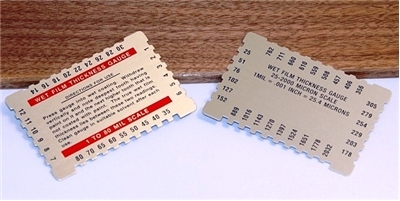 Wet mil gauges allow you to check a test surface for the thickness of material that you've applied. Simply press the appropriate edge of the gauge into the wet finish and identify the last marked point. This is the wet mil thickness. Once determined, you have an indication as to appropriate spraygun settings and traverse rate of the spraygun. You also have a visual reference as to how your material should "look" when properly applied. Caution: Should NOT be used on final project sprayed surfaces as a blemish will remain after removing gauge.